Coming into Friday night's contest in Ottawa, the beginning of the past week had shown 2 thrilling victories on the road vs. Carolina and Washington. Then a return to the Garden left fans weeping over 3 straight defeats to decent teams (Tampa Bay, Buffalo and Minnesota) that dropped the Rangers into 8th place on the cusp of oblivion. During the dismal home stand, the Rangers' inability to score -- one goal in each game -- shaky defense, shaky goaltending and terrible special teams were disheartening and fatal. Arriving in Ottawa, the Rangers did not appear fazed and were not panicking -- the players had regrouped and talked a good game. Coach Tortorella extolled the efforts of the players, singling out Brandon Dubinsky for his effort (although he may have been the worst Ranger for the past 2 weeks), and pretty much assured them that he had his back. Glen Sather, using understanding that he has a good blend of talent, did not pull the trigger on any trades to unload young assets for a rental and gave the entire team a vote of confidence. BTW, anyone notice that Brad Richards still has concussion symptoms? 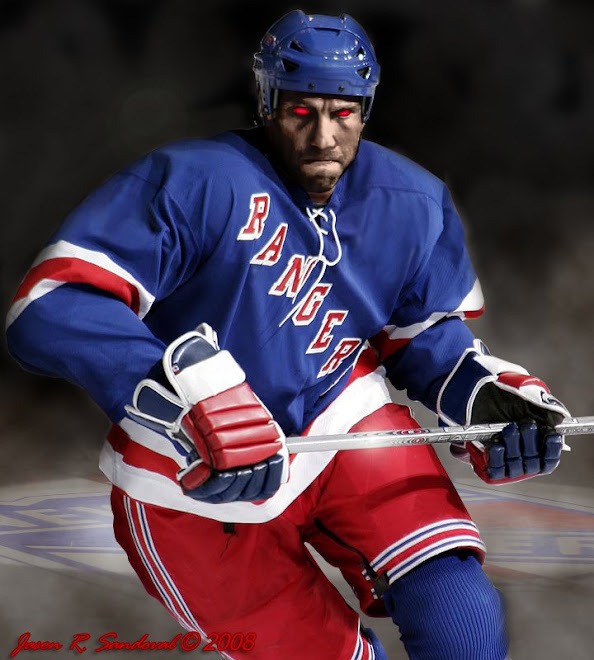 How nice it would be for Dallas to have 2-3 Rangers playing while the Blueshirts played nursemaid for Richards. The players' ongoing mission has to be to put pucks in the net and keep opposing pucks from getting behind Henrik's back. We know the former has been a struggle all season long and it keeps getting harder thanks to an unending parade of injuries -- add Del Zotto and McDonagh to the list late in the week after losing Marty Biron earlier in the week. But for one night at least, in Ottawa, the Rangers put together a complete game effort -- their shooting was much more creative and accurate as they jumped out to a 4-0 lead on their way to a comfortable 4-1 victory. The official recap (did you think I would forget?) is here. Anderson could not cover in time -- low and along the ice to the glove side. 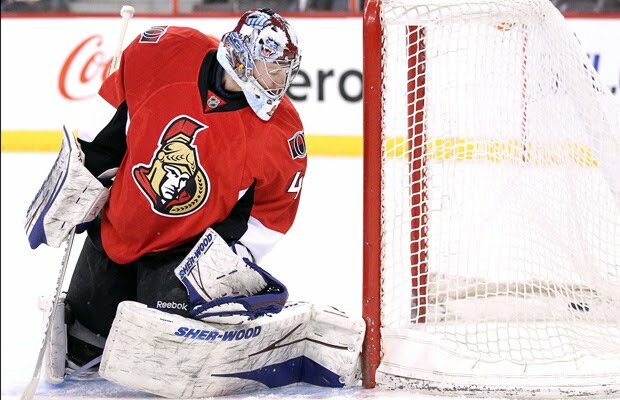 The team would be facing Craig Anderson with a sparkling 95% save percentage in his career against the Rangers (4-1-1, 1.48 GAA, .958 Sv %), That percentage took quite the beating as the Rangers scored 4 on 27 shots. During the game, they continued dominating swaths of ice and time in the offensive zone as they have all week but with much better results. The defense and goaltending were sharper (and perhaps luckier as a couple of deflections stayed out of harm's way as opposed to finding the back of the net like in the Minnesota game). Prospal would return and that he would actually show some of his scoring ability. Each of the Rangers' goals showed that the players were thinking better about their shot selection. Vinny Prospal slid his shot along the ice (after a wonderful feed from Sean Avery, his 21st assist of the season) and the puck went underneath Glen Anderson's glove hand -- perfect placement to beat him. In the 2nd period, Mats Zuccarello and Artem Anisimov scored 12 seconds apart. Zuccarello picked up a loose rebound of a Stepan shot in the crease and cruised in front of the open net and roofed the shot instead of shooting it into the goalie's side which we saw all too often this week at home. Anisimov took a crisp pass at the blue line from Ryan Callahan right after the ensuing faceoff and marched into Anderson's kitchen, made a strong move to his left and sent the puck into the back of the net. Finally, in the 3rd period, Derek Stepan took note of Zuccarello's shot and roofed his own for a goal to make the score 4-0. Each goal was a the direct result of confidence and forethought of each player putting the puck into places where the goalie would have difficulty if any chance at all to stop the puck. Contrast that with the number of shots that the Rangers flailed at in the slot against Minnesota or the shots they kept launching into Jose Theodore's midsection or the shots they could not lift over his prone body. Against Ottawa, these shortcomings were rectified. Now it becomes a question of whether the Rangers have learned a lasting lesson. Meanwhile, the Devils, Sabres, Hurricanes, Canadiens do not seem to want to lose and provide the Rangers with any cushion. Those teams are all bunched up around the Rangers. The Blueshirts could easily fall to 10th as much as rise to 6th depending on whether they string together wins or losses. Recent numbers are truly ugly for the Blueshirts -- 5 wins in regulations in their last 28 games (more than 25% of the season). 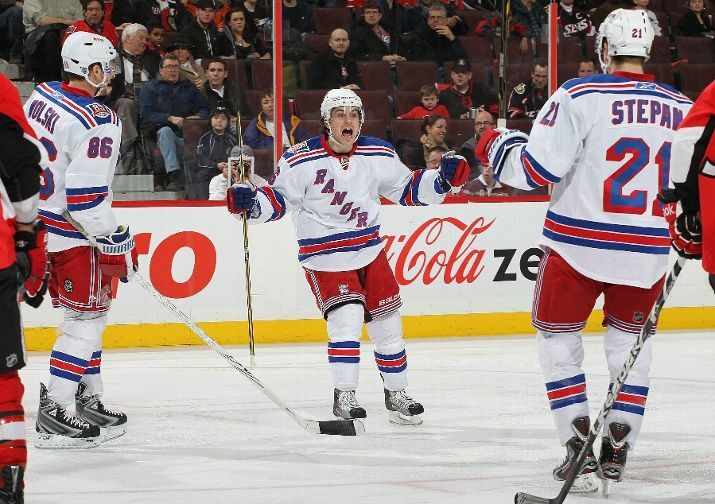 Since January 25, the Rangers are 4-10-1. Two of those victories are shootout wins. Included are several hapless offensive results where they only scored one goal (including the last 3 games of the home stand). Still, during that 3 game losing streak, you could see the team trying to make plays, try to break in on the net, try to shoot from all over the ice. To little avail. Why?? Some fans claim the team has no heart or is being victimized by its coaching -- these fans are and should be easily ignored. More thoughtful fans should realize the following two facts: The team is still very young. The team is not all that talented. Correct that -- they are talented if you are assembling only a roster of 2nd and 3rd line players with precious few of them having any finesse or sense around the net. Some players should be more advanced with their scoring skills -- Dubinsky (the leading scorer on the team with 43 points in 61 games, nearly identical to the 44 he had in 69 last season) and Callahan are primary culprits of missing open nets or shooting shots that totally miss the mark and carom around the boards and out of the zone. But the maturing of youth can lead to some unexpected gains -- for example, look at Brian Boyle, look at how Derek Stepan has developed, Zuccarello shows feistiness and fearlessness; Michael Sauer has been solid on defense; Ryan McDonagh shows that he has a clue. One friend eloquently summed up the Ranger offensive woes: "The Rangers need someone to pass to that can think and aim fast enough to make the lamp shine that wonderful shade of red. They don't have it and that's what they need." Mark my words -- Stepan, Wotjek Wolski and Zuccarello -- this trio will be good for 70-75 goals collectively next season and images of unfilled nets will be less of a problem. If Gaborik returns to form, and Dubinsky and Callahan can stay healthy and notch more than 20 goals each, and Boyle is not a flash in the pan . . . . I won't go so far as to look at the next coming of the Detroit Red Wings, but a noticeable offensive improvement is not that big of a stretch. Add an improving defense and a quality offensive free agent pick-up and you can see that the rebuilding process may pay dividends sooner than many fans expect. But I am getting way ahead of myself. Back to the here and now -- in another Sunday nationally televised matinee, the Rangers face the Flyers yet again. Fortunately, the Flyers played and lost (their 3rd loss in a row) to Buffalo on Saturday afternoon so the Rangers will be more rested. Then the Rangers bring their 20-13-5 sterling road record to visit Anaheim and San Jose in critical games for all participants. Another interesting week looms.